GREENSBORO, NC – Clemson junior Matt Clark, from Hyannis, MA, finished in second place with a career-best time of 24:09.40 in the 8K race at the Great American Classic in Cary, NC over the weekend. His performance helped him earn ACC Performer of the Week honors. It marks the second such honor of his career, as he also earned the accolade on September 27, 2004. Clark now has a first and second-place finish in two events this year. 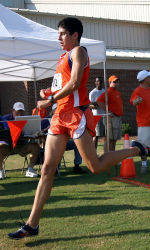 The 2004 all-region performer won the individual title and helped the Tigers to the team championship at the Clemson Invitational and S.C. Collegiate Championship on September 10.